I know there’s already a hundred thousand other banana bread recipes out there, but I swear to you that mine is different and it’s also the best. Why, you ask? Well because not only does this recipe incorporate bananas into the recipe, but it also uses peanut butter! If you can show me a better combination than peanut butter and banana (with the option for chocolate as well), I will give victory to you. 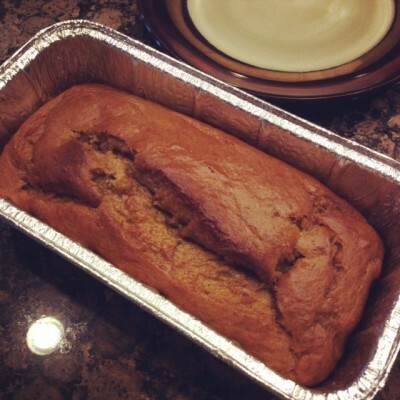 Until then, please enjoy this lovely and delicious peanut butter banana bread recipe. It’s moist, dense and it even gets better after the bread has fully cooled down overnight. Plus, the recipe uses very little butter and yogurt since the peanut adds the necessary moisture and fat for a great consistency. Let me know your secrets to a great banana bread too, please. I’m always looking for ways to fine tune it! Preheat oven to 350 degrees Fahrenheit, and spray one 9×5 inch loaf pan or two 5.5×3 inch mini loaf pans with nonstick cooking spray. In a large mixing bowl, mix bananas, eggs, yogurt, peanut butter, butter and vanilla extract at medium speed until well blended. Add sugars and beat well. Add baking soda, cinnamon and nutmeg, reduce speed to low and mix well. Add flour and mix until just blended. Optional: Add semi-sweet chocolate chips and mix into batter by hand. Pour batter into prepared loaf pan(s) and bake at 350 degrees. For full-sized loaf pan, bake 65-75 minutes until toothpick comes out clean. For mini loaf pans, bake 40 – 50 minutes until toothpick comes out clean. Remove from oven and let cool in pan for 30 minutes before removing to cool completely on baking rack. If desired, dust with powdered sugar once completely cooled. Here’s what this pretty loaf looks like fresh from the oven. Two delicious slices of bread ready to be devoured with coffee. 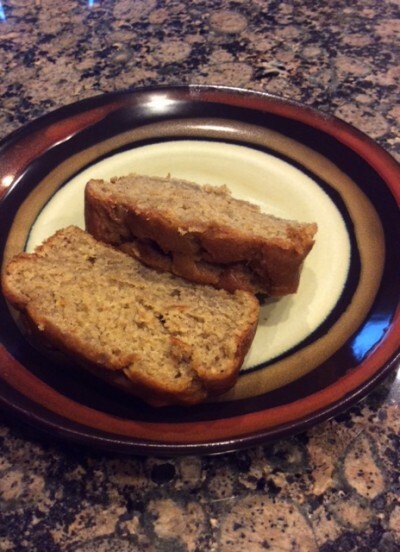 This entry was posted in Desserts, Recipes and tagged Banana, Bread, Desserts, Peanut Butter, Recipes on June 9, 2014 by Paige N..